On average, every Canadian uses a total of 300 litres of water each day, making our consumption among the most in the world. Comparatively, households in France use roughly 150 litres per person every day. 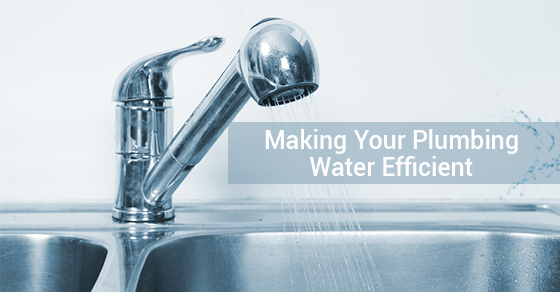 Putting in an effort to conserve water means that you are doing your part to protect one of our natural resources with the added benefit of lowering your monthly utility bill at the same time. The majority of us are likely familiar with the basics of conserving water. This means not running the water while you are brushing your teeth and also washing your hands with cold water instead of wasting water waiting for it to warm up. You also probably know that you should limit your showertime as much as possible, as well as reducing the number of times you flush your toilet. However, there are some additional ways that you can conserve water even further. Installing a water meter is effective because it makes you aware of your water usage. In fact, households with water meters use 39 percent less water per person than homes without them. If your fixtures are older, you could potentially cut your water usage in half by installing low-flow showerheads in your home. The return on investment is very substantial for such a small change. Using rainwater to water your gardens is a great alternative and can be done with as little as a $100 purchase on a rain barrel. Consider a dual flush toilet for your home as they use up to 67 per cent less water than toilets that are older. Dual flush toilets are quite affordable as well. Composting toilets, which don’t use water to flush waste nor do they need a septic tank in order to use them, are another alternative if you are looking to upgrade your toilet. Recycling your grey water, which is previously used water from your bathroom sinks and showers/baths, for example, will take your conservation efforts to the next level. Recycling your grey water involves installing a double piped drainage system and then purifying that water. Whether you are in need of plumbing, water heating or water services, contact our team of experts at Brothers Plumbing today. We have over 50 years in the industry and offer affordable rates.